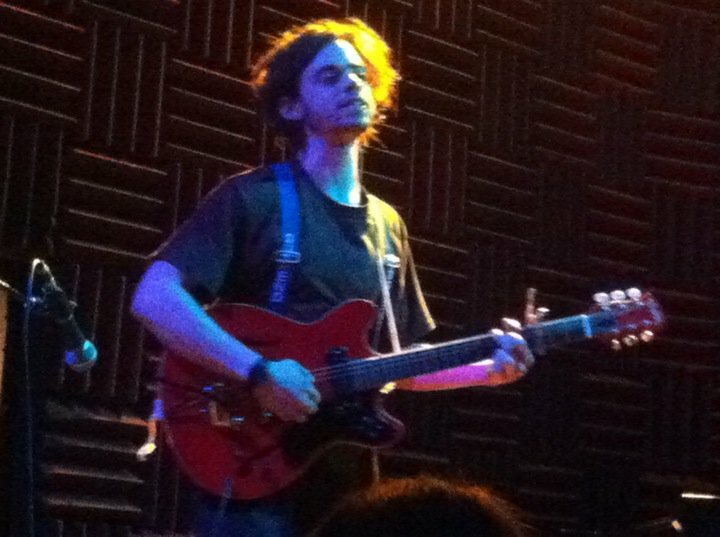 Geo Wyeth at Joe's Pub, June 11, 2011. Novice Theory no longer, Geo Wyeth played original songs and some choice covers (‘Long Black Veil,’ ‘Ain’t Got No/I Got Life’) at Joe’s Pub last night. No shorthand does justice to his sound, which has developed in the years since I began catching his shows. The songwriting is more imagistic than on the first Novice Theory CD, the voice raspier, the performance style even more furious, possessed, incantatory. Last week, by coincidence, I had caught his first show in Berlin, at an alternative art and dance space, and that short set was different (although it also featured ‘Long Black Veil’): he banged his drum so hard on the cement floor that he snapped his guitar cable in two, and had to scramble for a new one. He also used live looping in that show: this one featured a horn player. I bought the EP “Black One” by Jive Grave, Wyeth’s “experimental rock ensemble,” which is a great amuse bouche for this fall’s LP “Alien Tapes.” Also amusing is Cole Escada’s interview with Wyeth at East Village Boys.